CINCINNATI -- The building might not be the only piece of history getting a facelift as part of Union Terminal's $212.7 million overhaul. The Cincinnati Museum Center also is exploring how it can bring some of the terminal's original artwork back to life. Art conservators came to town earlier this month to examine 22 panels of paintings by French-born artist Pierre Bourdelle that for decades hung in Union Terminal's main dining room. The paintings, which were adhered to plaster, were removed in 1990 and placed in storage when the Museum Center took over the building. The concern was the art would be damaged during repairs to the ceiling in what is now called the Gateway Café, said Scott Gampfer, director of the Museum Center's History Collections and Library. The original plan was to raise money to restore the paintings and get them back in their rightful spots, but that never happened, Gampfer said. But the painting plan resurfaced after Hamilton County voters approved a quarter-cent sales tax increase in 2014 to fund the Museum Center's restoration. "When we started talking about the restoration of Union Terminal, we talked about putting the artwork back," he said. "No one except a few staff members has seen them since 1990." Gampfer described the artwork as "stylized and whimsical views of animals and food," and images of them were captured in early black and white photos. But now the paintings are little more than shadowy shapes under decades of soot, nicotine stains and grime. 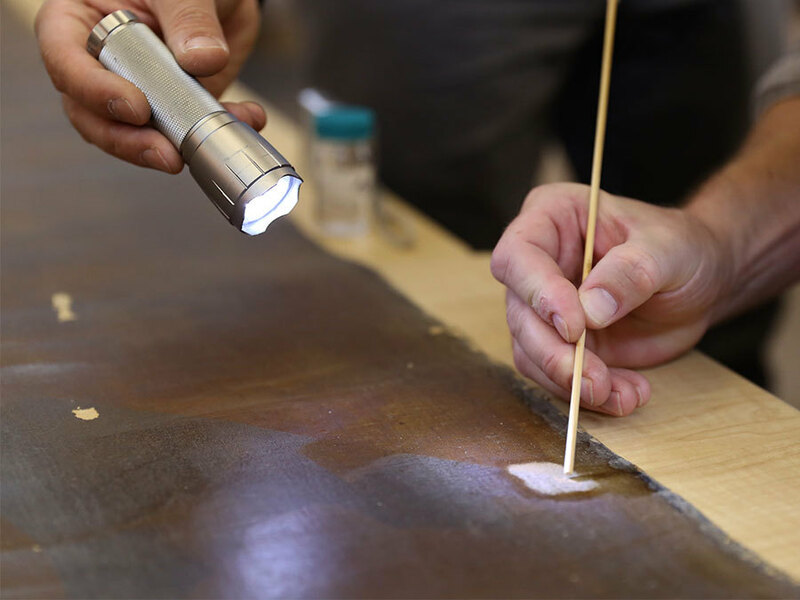 It's up to the art conservators to determine what it will take to clean the artwork and bring it back to its original condition. WCPO got an exclusive look at what that work entailed. 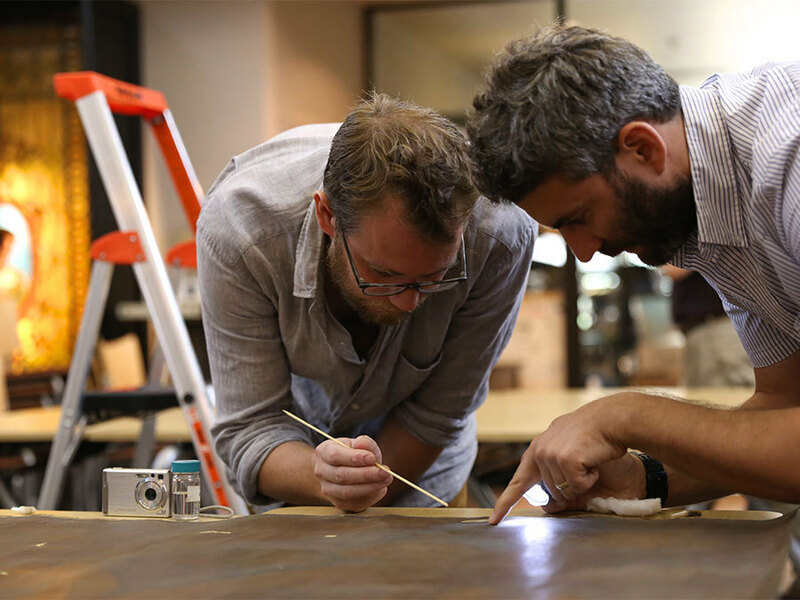 Oliver Watkiss and Steve Gayler, two senior conservators with the art conservation firm ArtCare , were charged with examining each panel inch by inch -- 786.5 square feet of artwork in all. The paintings are on a fine, linen canvas and have been stored in long cardboard tubes for more than 25 years. Most have been stored at the Museum Center's Geier Collections Facility in Queensgate. 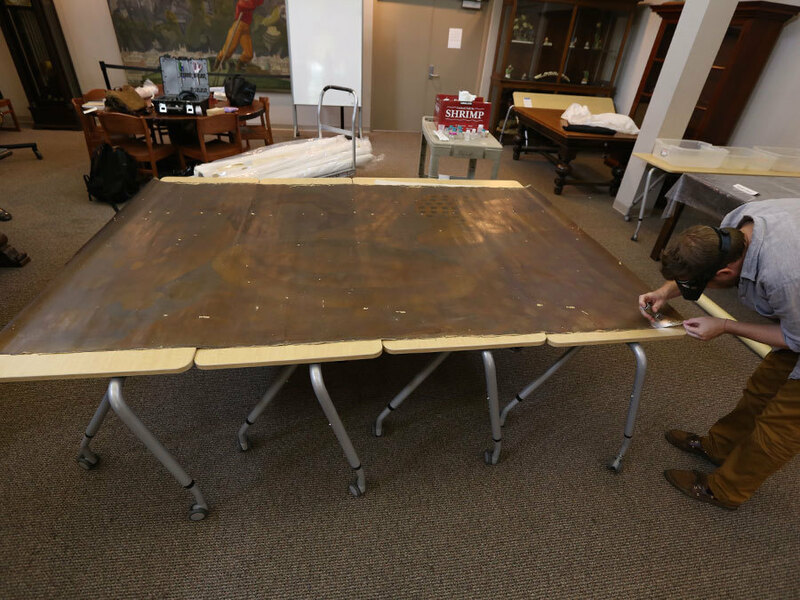 One by one, the conservators carefully removed each panel from its tube, unrolled it onto tables and removed layers of glassine paper that have been protecting the paintings for all these years. Their goal was to document each work by taking photos and then do "cleaning tests" to determine which solvents worked best to remove the decades of dirt and grime to see the vibrant colors hidden underneath, Watkiss said. The paintings date back to 1932 and 1933 and have rips, holes and spots where the original paint has chipped away completely. But a few quick cleaning tests showed how beautiful they could be if they are cleaned and restored. Gayler used a long, cotton swab in solvent to roll over an area the size of a quarter on a painting that appears to feature a giant croissant, a shrimp and something that looks like a deep-dish pizza. Hidden beneath the grime along the croissant's edge was a vibrant green the color of celery. "It's quite a dramatic change," he said. "This one could be quite colorful actually." That wasn't the only surprise. A shimmery silver color was applied across many of the canvasses before the other colors were sprayed, stenciled and painted on, Watkiss said. The silver was especially delicate, as was a dark background area where the paint layer seemed particularly soft, he said. "Anything silver is going to be slow," Watkiss said. The conservators had to proceed with caution, using different types of solvents until they found the one that worked best without doing damage to the original artwork. The deliberate process was part art, part science and part detective work. Watkiss and Gayler conferred, took pictures and occasionally grabbed things from their toolbox filled with plastic droppers with suction bulbs, purple gloves, blue tape and headbands with magnifying glasses attached. At one point, Gayler and Watkiss draped a black cloth over their heads to examine a portion of one of the paintings with an ultraviolet light to get what amounted to an x-ray of the artwork. By the end of their four-day visit, they had all the information they needed to go back to their respective offices to develop an estimate for how much time it would take -- and how much money it would cost -- to revive the Bourdelle panels. Gampfer said he hopes it's something the Museum Center can afford to do as part of Union Terminal's rebirth, which is scheduled to be finished in the late fall of 2018. "It's our best opportunity to put back some of the original features," he said. "I'm excited. I've always felt they should be back in the building." Lucy May writes about the people, places and issues that define our region – to celebrate what makes the Tri-State great and also shine a spotlight on issues we need to address. To read more stories by Lucy, go to www.wcpo.com/may . To reach her, email lucy.may@wcpo.com . Follow her on Twitter @LucyMayCincy.